With its beautiful iconic design, extra-large sewing space and numerous time-saving features, you'll love this One. The One sewing machine has time-saving features that will make your sewing a breeze. Start by threading your machine effortlessly with the SwiftSmart™ Threading System with Built-in Needle Threader. The Drop & Sew™ Bobbin System stages the bobbin thread perfectly so there's no need to draw up the bobbin thread before starting to sew! Choose from a great collection of 24 different stitches. With a single touch of a button, your stitch is ready to go. You can sew larger projects like quilts, curtain panels, duvets and more thanks to a large sewing space. Take off the Removable Storage Compartment to access the Free Arm – great for hemming trousers for sleeves, sewing children's clothing and other smaller projects. It's easy to see as you sew, too, thanks to 3 LED Lights that illuminate the sewing surface to eliminate shadows. Whatever you want to sew, you'll love this One. One-Step Buttonhole (2)Buttonholes are sewn in one easy step. Just place the button in the buttonhole foot and the machine sews a buttonhole perfectly sized for that button, delivering consistent results every time. Built-In Needle Threader (+)Effortlessly threads the eye of the needle eliminating eye strain and saving you time. SwiftSmart™ Threading System (+)Guide the thread directy from the spool to the needle area through a single groove, then thread the needle by pressing the threading lever for one-touch threading. 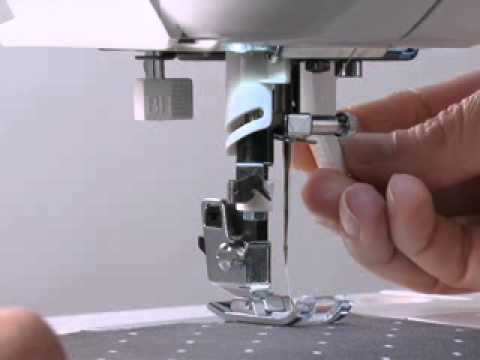 Drop & Sew™ Bobbin System (+)Threading the bobbin has never been easier! Place your wound bobbin in the bobbin holder, stage the thread in the thread guides and you're ready to sew. No need to draw up the bobbin thread, saving you time. Top Drop In Bobbin (+)Easy to thread and easy to see! The tranparent bobbin and cover allow you to monitor your thread supply so you don't run out of thread in the middle of a seam. Drop Feed (+)Feed teeth can be lowered for button sewing or free-motion sewing - a must-have for quilters! Simply slide the Drop Feed Lever to lower the feed teeth. Slide it back and turn the handwheel one full turn to raise the feed teeth again. OneTouch™ Stitch Selection (+)Stitches are displayed on the machine's front panel. Simply touch of the button for the stitch you want and start sewing. Direct Selection Stitches (+)Most commonly used stitches are conveniently located on the front of the machine and available with a single touch of a button. Adjustable Stitch Length (5mm)Customize the appearance of a stitch by increasing or decreasing the distance between stitches. Use this function for various stitch techniques like applique, basting and more. Adjustable Stitch Width (7mm)The size of the stitch from left to right is adjustable, to make the stitch sew narrower or wider as desired. Self-Adjusting Tension System (+)Select your stitch with the turn of a dial, and the machine will adjust the tensions for your selected stitch automatically, saving you time. Reverse (Touch Button)Sew stitches in reverse, usually done to secure a seam at the beginning and end to prevent unraveling. High Speed Stitching (750/min)Professional speed for faster results. LCD Screen (+)LCD screen clearly displays your selected stitch as well as stitch settings for length and width. Presser Foot Sensor (+)The presser foot must always be lowered before stepping on the foot control to start sewing. If an attempt to start sewing is made without first lowering the presser foot, the machine will signal with a beep to alert you to lower the presser foot. Twin-Needle Function (+)For stitches other than the straight stitch, this function reduces stitch width for sewing with a twin needle so the needles clear the presser foot while sewing. Package of 4 Class 15J Bobbins. Make sure to check for compatibility with your machine! Package of 12 Class 15J Bobbins. Make sure to check for compatibility with your machine! This handy storage accessory holds over 20 bobbins and works with plastic or metal bobbins, both small and large. Perfect for stabilizing knits and other stretch fabrics when embroidering or decorative stitching.